Factory Forty Six provides road riding, touring trips. 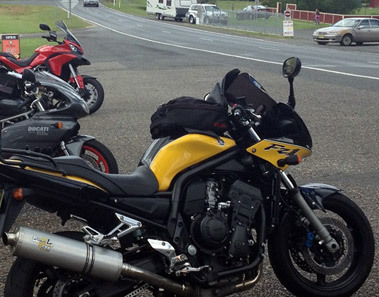 The most popular one is the day trip around the Far North Coast of NSW. But, in saying that, the best ones are the ‘overnighters’. This gives us an opportunity to really ‘get out there’, as we are blessed to have some many great roads and scenery here in Northern NSW. With your tour leader, who has a tremendous amount of local knowledge of the local and outlying areas, we can tailor make a ride that suits what you are looking for. A ride along the coastal areas, thru rainforest regions or up on the New England Plateau, we can do all the logistical work. Fuel stops, meal breaks and accommodation can be all looked after. All you have to do is come along for the ride. Do not forget to bring your camera, as we know all the great lookouts and hidden interesting history spots also!! Factory Forty Six also provides off road riding. If you have done a dirt bike rider training course, and then want to try your new skills out in the bush, we can do a day ride in the state forest. Just need to have a currently registered bike and license, and away we go. Contact us today, to get planning under way.